From Goodreads: Three teenage descendants of Medusa, the once-beautiful Gorgon maligned in myth, must reunite and embrace their fates. Gretchen is tired of monsters pulling her out into the wee hours, but what can she do? Sending the minotaur back to his bleak home is just another notch on her combat belt. She never expected to run into this girl who could be her double, though. Greer has her life pretty well put together, thank you very much. But that all tilts sideways when two girls who look eerily like her appear on her doorstep and claim they're triplets, supernatural descendants of some hideous creature from Greek myth, destined to spend their lives hunting monsters. . . . I am a fan of Tera Lynn Childs' Fins series so I was excited to read this. Add the fact it's based around Greek Mythology and Medusa and I was sure I would enjoy it. Just as I expected, it's a brilliantly light and fun read. The story is narrated by each of the sisters, with all being given a very distinct voice. I'm a massive fan of this narrative style and it works so well here, both because it gives us the chance to get to know the sisters really well, but also because it infuses energy into the story. Gretchen, Grace and Greer are brilliant characters. I loved Gretchen and her sassy, rough around the edges character. In contrast, Grace is just so incredibly sweet it is impossible not to love her. And Greer, who is only introduced towards the end of the story, is obviously blindsided by the news of who she is. I'm looking forward to getting to know her better in the next instalment. The male characters are also ace! While I didn't warm quite so much to Nick I am very intrigued by him (and I think anyone who wishes to catch Gretchen's attention would have to be very persistent!). Both Thane and Milo were really easy to like - the budding relationship between Milo and Grace is really sweet. And Thane obviously has some secrets and I'm very excited to find out what they are. Love the action too - it's great to see the girls really hold their own! I can't wait to read the next book in the series - the ending is a killer! 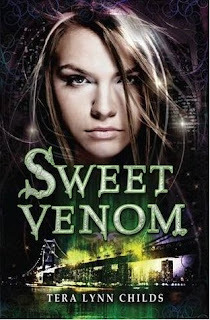 I will definitely be picking up Sweet Shadows as soon as it's published. I love multiple narrative and Greek mythology so I think I'm going to love this! I love Greek mythology so I think I'd like this! Great review!